Coconut water has become one of the new leading trends out there. The claim is that coconut water is rich in antioxidants and electrolytes which helps in replenishing hydration. Mango is also known to be rich in nutrients. Why wouldn’t a company introduce a coconut water body wash infused with mango? Let me start off with an apology for no actual photographs. This product is definitely formulated for the entire family. I noticed the body wash was disappearing quicker than usual. When asking who had been using the body wash, only my daughter would admit to it! I suppose it’s understandable for the men to deny using this nourishing soap. Anyhow, this particular bottle of body wash was empty before the week was over! Someone had already tossed it in the outgoing recycling. Therefore, my reasoning for no product photo’s. I didn’t have a chance to snap them in time. I did head out to look for a new bottle, but couldn’t locate one. I’m hoping this becomes available in my area soon. While I didn’t find the Dial Coconut Water with Mango hydrating body wash, I did locate the original Dial coconut water. You can fully expect to see more detailed photo's in the future. I've learned my lesson about procrastinating! Body wash is an important regiment in my daily skincare routine. The Dial Coconut Water with Mango lathers exceptionally well. The mango is quite aromatic and friendly to the senses. I like to joke about knowing when my family just showered. I can be in the living room and the aroma fills the house. My guys usually shower with Dial for Men. However, I just know that one (or both!) had to enjoy the Coconut Water with Mango as well. Either that or my daughter used well beyond the normal amount! I’ve been known to do this myself. Either way you look at it, this product was relished until the end. While I enjoy a variety of body wash fragrances, I will be in search of this particular scent in the future. 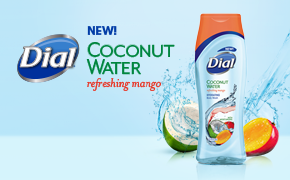 The Dial brand provided me with a sample of Dial Coconut Water with refreshing mango. However, all opinions are unbiased and my own. Please remember that results vary. Product may not be suitable for all consumers. Consult your dermatologist or physician before use if you feel this may cause skin irritations.